With the adoption of the 2030 Agenda and the Sustainable Development Goals by Heads of States last fall in New York, the urgent practical question is how to finance the data needs of such an ambitious and universal agenda. Many developing countries already struggled with providing the data needed for the MDGs with its eight goals; how can we expect countries to measure and monitor the much more ambitious SDG agenda, with its 17 goals, 169 targets and 230 indicators? Financing SDG data needs alone will require an enormous amount of money; money that is better spend elsewhere as is sometimes argued. Surprisingly though, two recently published reports argue the opposite - with some modest additional investment in data and statistical capacity of less than a USD billion per year, the job can be done. Here's why. In the 2010 census round, 17 of 20 countries in Latin America included questions on indigenous people that required detailed data. Data on maternal care revealed that around the turn of the century, the proportion of births attended by health professionals was 38 percentage points lower among indigenous women than non-indigenous women in Mexico, and 45 percentage points lower in Peru. The availability of these disaggregated data led to the adoption of more effective interventions to reduce inequality and improve social conditions such as maternal mortality. By 2012, more than 80% of births by indigenous women were attended by health personnel in both countries. 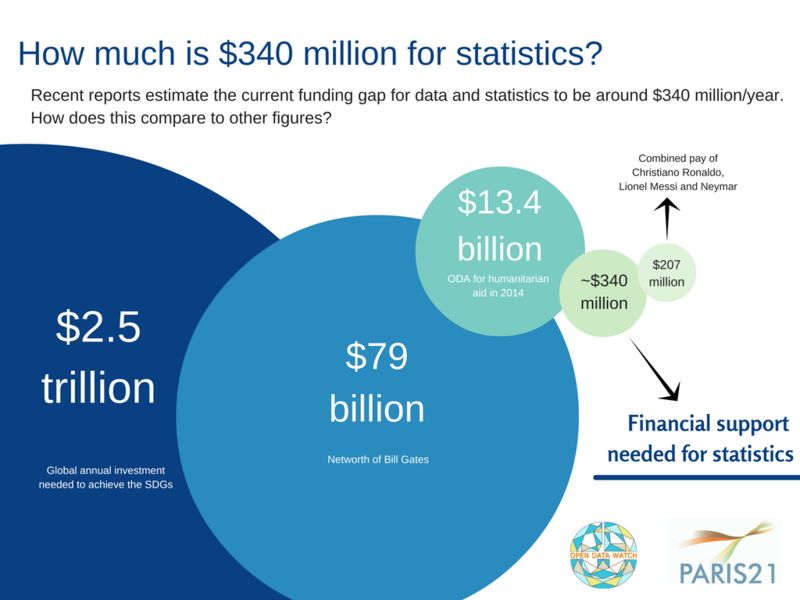 So how much money is needed from both developing and developed countries to produce the data that allows us to effectively measure and monitor SDG implementation? 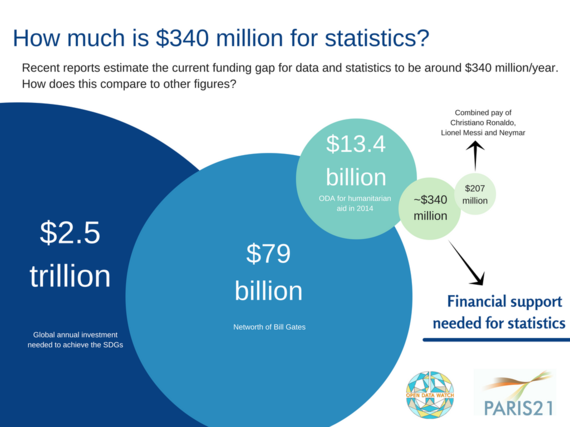 The Global Partnership on Sustainable Development Data's "State of Development Data Funding" and PARIS21's "Report on Support to Statistics (PRESS)" provide cost estimates on the SDG data production for 77 IDA eligible countries over the next 15 years and estimate the increase in domestic and donor funds needed to make this happen (see Chart 2). To help developing countries measure and monitor the SDGs, around USD 5.1 billion for the period until 2030 is needed in extra donor funding. This equates to some USD 340 million per year which is less than 0.5% of Official Development Assistance (ODA). This amount will be slightly higher if the additional needs of the 67 IBDR countries are taken into account, which have an estimated cost per year of USD 85 million. While a $340 million price tag for data and statistics is not insignificant, it is nearly equal to the combined salary and endorsements of three top soccer players - Ronaldo, Messi, and Neymar - which stands at $207 million. Comparing this figure to a few other examples can provide a better perspective. Some make the case that this funding is better spent on social issues such as the elimination of communicable diseases, aiding the refugee crisis, or eliminating hunger. But funding data can have a multiplier effect. A report from the McKinsey Global Institute says that when data is available and open, it can unlock $3 to $5 trillion in economic value annually across the studied sectors. But as the two reports also point out too, money alone will not do the trick. In addition to increased aid for statistics, funding agencies should consider ways to make aid for statistics more effective. More evidence is needed to identify the design of effective aid instruments and measure their impact. There may also be opportunities for the use of non-traditional funding methods such as sponsorship, basket funds and budget support linked to the implementation of statistics plans, seconding of in-country specialists to manage aid, or regional approaches using trust funds. The level of aid for data and statistics is important, but so is the way in which it is provided. Some have suggested that investing in public infrastructure and capacities in developing countries for data and statistics is a waste of money in the era of "big data". They refer to the ability of having citizens crowdsource data, using data from the private sector and producing low cost and real time data from technology innovations such as call detail records (CDRs) or satellite images. Science magazine recently published a paper which looked at the use of satellite images to study poverty and assess economic activity. It is true that new data sources offer potentially high impact solutions replacing or complementing more traditional official statistics but for now there are many issues that limit the usefulness of big data for producing official statistics and particularly data for developing countries. Along with standard big data issues like accuracy, privacy, regulation and governance, developing countries are particularly susceptible to methodological problems such as fewer new data sources, issues with limited internet access and lack of private sector investment. Despite the hype and excitement that surrounds the potential of big data, official statistics will continue to provide a necessary baseline for important policy decisions. Strengthening the capacity and effectiveness of national statistical systems and national data agencies will be crucial to deliver on the data agenda. The work of developing statistical systems will take deliberate action on the part of governments, collaborating with the private sector, NGOs, academic institutions, and all those who recognise the value of statistical evidence for guiding progress toward the SDGs.